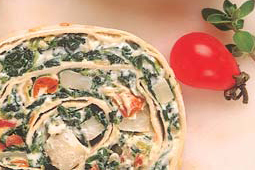 Spinach Dip Lahvosh Wrap - A recipe from Savor California, the online showcase for extraordinary gourmet foods and beverages from California. Thaw and drain the spinach. Drain the water chestnuts and chop. Combine all ingredients except the Lahvosh Wraps and chill the dip about 2 hours. Spread dip evenly on one sheet Valley Wrap® Soft Lahvosh. Roll up jelly-roll fashion. Wrap tightly in plastic wrap and refrigerate several hours to overnight.